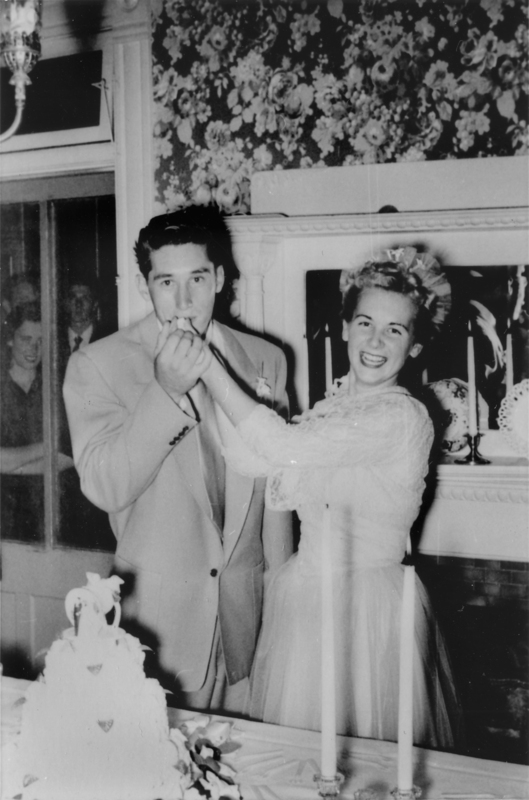 Mentryville resident June Rundberg (Hart High Class of 1950, daughter of residents Joe and Helen Rundberg), celebrates her wedding to Wayne Hamaker in the dining room of the Pico Cottage (aka Big House) in Mentryville. Photo courtesy of June's younger brother Bill Rundberg (Class of 1951), who writes: "In August 1952, June married Wayne Hamaker, also Hart High '50, in a simple, beautiful lawn ceremony. Friends decorated the black walnut tree with flowers. For music we used the piano in the den. It was the room downstairs on the southwest corner. The pianist played loudly. People dressed up as much as the heat would allow, certainly more than I saw during the entire rest of our time there." The Rundberg family lived in Mentryville from 1948-52. BR5201: 9600 dpi jpeg from copy print.